Have you booked a holiday in Tenerife? In that case, it is highly likely that your flight will land in the runways of Tenerife South (TFS) in the Canary Islands. 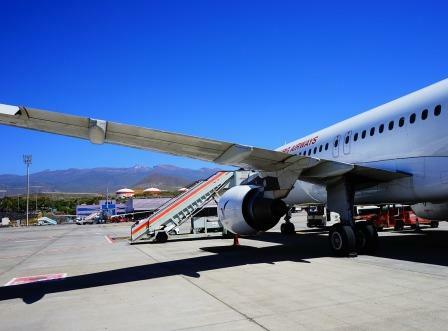 While Tenerife North (TFN) is closer to the capital city of the island –Santa Cruz-, the airport in the south stands a short drive away from Costa Adeje and Santiago del Teide, thus being frequently chosen by those heading to the villas and beach resorts for a vacation. In the event of finding yourself at the wrong airport on your day of departure, you still have the opportunity to commute from Tenerife North to Tenerife South or take the reverse journey by bus; it will take about 50 minutes to go from one airport to the other. You must take bus 343 outside the arrivals hall of either terminal; when travelling from Tenerife North airport, services start at 6:50 and run until 21:40, however, the first bus from Tenerife South departs at 8:40 and the last one at 23:20. Single tickets for this route cost 9,70 euros. As the busiest airport in the island and the second with the most traffic in the archipelago of the Canary islands, Tenerife South airport sees millions of travelers arrive and depart every year. Nevertheless, the total of its operations are remarkably handled from a single-terminal building divided into three different levels: a basement that accommodates supporting baggage claim areas, the ground level with all check-in desks, services, security filters, departures concourses and luggage belts, and lastly, an upper level encompassing offices and transit walkways. Would you like to know which airlines fly to TFS? The listed below are international airlines operating scheduled flights to Tenerife South International all year round. Bear in mind that many other carriers may run operations to and from the island on a seasonal basis as well. Aeroflot (from Moscow Sheremetyevo), Aer Lingus (Dublin), Air Europa (Alicante, Santiago de Compostela), Austrian (Vienna), Binter (Gran Canaria), British Airways (London Gatwick and Heathrow), Brussels Airlines (Brussels), Condor (Berlin Schönefeld, Düsseldorf, Frankfurt, Hamburg, Hannover, Munich, Stuttgart), Easyjet (Bristol, Edinburgh, London Luton, Manchester, Milano Malpensa), Edelweiss (Zürich), Eurowings (Berling Tegel, Cologne), Germania (Dresden, Münster), Iberia (Madrid), Jet2.com (East Midlands, Birmingham, Glasgow, Leeds, London Stansted, Newcastle Upon Tyne), Luxair (Luxembourg), Norwegian (Málaga, Rome Fiumicino), Ryanair (Belfast International, Billund, Bologna, Bournemouth, Cardiff, Cork, Charleroi, Eindhoven, Kraków, Liverpool, Seville, Wroclaw and more), Thomas Cook and TUI (from airports across the UK, Belgium, Deutschland and the Netherlands), Transavia (Amsterdam, Rotterdam, Paris Orly), Vueling (Barcelona, Lyon) and Wizz Air (Budapest, Bucharest, Vienna and Katowice). There are several transportation options to go from Tenerife South airport to your hotel in Tenerife after landing and collecting your bags. Aside from the traditional taxi ride and some offered shuttle services, you may choose to transfer by public bus from the TFS terminal for less than 4 euros or hire your own vehicle at one of the car rental offices in Tenerife South for greater independence. Bus line 40 departs from outside the arrivals level in Tenerife South and transports passengers to Los Cristianos and Costa Adeje, where many holiday hotels and resorts are located, close to the most beautiful beaches in the island. This service starts running at 7:40 and ends at 21:40. Should you opt for renting a car in Tenerife South, head over to the desk of your company of choice in the public arrivals hall; you may choose among AutoReisen, Hertz, Sixt, Cicar, GoldCar Rental, Europcar, TopCar and InterRent. The terminal of TFS also has a variety of shopping outlets where you can spend your waiting time before boarding: a World Duty Free shop, a luxury-brand store (The Mint Company), internationally renowned brands like GAP and Superdry, among others. Besides, if you are eligible for a VAT refund, you get the chance to process your request prior to leaving by turning to the Civil Guard counter on the ground floor to have your receipts stamped first, then going to the Global Exchange office in either the arrivals of the boarding concourse to get your refund. Previous How many airports are there in London, UK?